LONGi Solar was recognized by China Building Material Test & Certification Group Co.,Ltd. (“CTC”) as a “Top Runner” in the power degradation of photovoltaic modules. This marks the third year that LONGi Solar has won the honor since 2016. The outdoor aging test showed average degradation of LONGi Solar’s photovoltaic modules to be 0.38% in the first year, 0.32% in the second year, and 0.36% in the third year, with all 3 years ranking first among allmonocrystalline modules tested. Cumulative three-year degradation was just 1.06%. CTC carried out quality supervision and spot checks at the outdoor test base in Hainan. 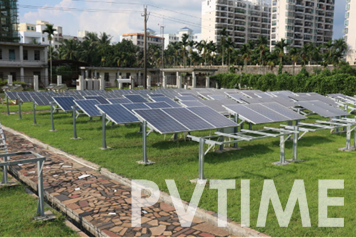 Products from enterprises that meet the Standard Conditions for the Photovoltaic Manufacturing Industry of the Ministry of Industry and Information Technology test criteria are published once a year. To ensure objectivity and impartiality, the tests are conduced “blind” – CTC does not inform enterprises of spot checks, and samples are randomly selected from production lines or warehouses and transported to the test base. Since March 2015, the CTC, entrusted by the Ministry of Industry and Information Technology, has carried out this quality supervision and spot checks on enterprises’ products to study the performance degradation and lifetime assessment methodology of modules and systems under typical climatic conditions in China. This will provide the government with a fair and authoritative database and a product quality analysis report for industry management. The database is the first national outdoor substantive information for photovoltaic products in China, and is an important technical support reference for the Standard Conditions for the Photovoltaic Manufacturing Industry and the “Top Runner” program of the Ministry of Industry and Information Technology.